I once spent time (and money) on an MBA course and one of the most important things I learnt was that almost anything can be portrayed on a 2D matrix. So here, tablets and eReaders are shown in their own 2D-matrix world1. And where will we find the Kindle Fire - perhaps it might have been called the KindleTab? And what about the iPads - 2 and 3. Well here's the map, with the Kindles all sitting towards the top, with a very engulfing ecosystem of books, movies and apps, while the more open Google Nexus 7 is lower down. The original Kindle eReaders are towards the left - low on technical features, while the iPads are more to the right. And where did Steve Jobs place the iPad in a bid to make serious money? In the middle, that's where. He originally showed the way by positioning the iPad short on features - for instance the rear camera was tiny on the iPad 2 and without its dock, the iPad lacks any significant connection options like HDMI. But he also unsettled the opposition by undercutting them on screen resolution thus allowing Apple to set the iPad at a price that other manufacturers found hard to follow. In a homage to Steve Jobs, Amazon hoped to repeat Apple's trick of doing less than expected, but doing it very well. In part this is an acknowledgment of the principle that on a "map" like this, less money is made by products that position themselves too near the edge. As it says in the bottom left, "Thar be monsters here". But actually many manufacturers have also been dipping their toes in the water far too close to the right hand side of the map. Thar be monsters there as well, as it turns out. You are unlikely to remember the LG Optimus Pad, which, for a frighteningly high price, offered 3D video - a feature that has turned out not to be attractive enough. It seems also that Apple felt Samsung's Galaxy Tab 10.1 was too close to the iPad 2 on the map and tried to exact legal and patent retribution. 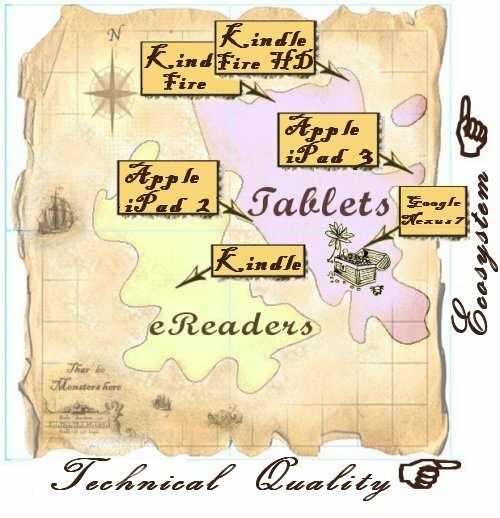 So the Kindle Fire aimed to avoid all these dangerous places and to offer a product which was rather more Kindle and less Tab than many of us were expecting. Pixels and cameras were being rationed to offer a product that would sell big - but for a quite a small price. Now we can see that the new Amazon Kindle Fire HD has moved to offer a higher technical specification. Of course, over time, we can expect a gradual migration of all gadgets towards the right of the map. Amazon is being careful not to move too quickly, while Apple may have leapt dangerously close to the monsters on the right in introducing the iPad 3 with its hugely high screen resolution.